Kilfinan or Gaelic Cill Fhionain, ‘the church of St Finan’, stands on a steep hill above a tight bend in the burn, in the middle of the village which takes its name from the church. It is not certain who the Finan was who is commemorated at Kilfinan, as there are many saints of that name. There was a St Finan son of Rimíd who was a monk of Iona and who ended his life in AD 660 as bishop of Lindisfarne in Northumbria. His feast-day was on 17 February. There was another Finan commemorated in the ninth-century Félire Óengusso on 16 March as Fínán laindrech lobur, ‘bright-shining Finan the leper’. Kilfinan may have been dedicated to either of these, or to another Finan entirely. Kilfinan – the church of St Finan in its graveyard. Though the church building has been much altered and added to in the post-Reformation period, it clearly stands on the site of the medieval church, and even seems to incorporate parts of the older building in its fabric. The long narrow shape of the present church echoes the form of the medieval building which was built for the enactment of the liturgical drama and for sacramental use. The architecture of Scottish churches changed after the Reformation, when a greater stress was placed on the talking minister – praying and preaching – so that the typical Scottish church began to be designed with that in mind, and to appear more like an auditorium. Kilfinan, however, has retained its earlier form. Kilfinan parish church was granted to Paisley Abbey in the thirteenth century. This was a time when the Stewarts, with their powerbase in Renfrewshire and with Paisley Abbey as their principal church, were expanding their influence in the lands of the Firth of Clyde. Coming under political and military pressure from the Stewarts, Duncan son of Ferchar and Lamont (Laumannus) son of Malcolm, Duncan’s nephew, granted the church of Killinan (i.e. Kilfinan) to Paisley Abbey. 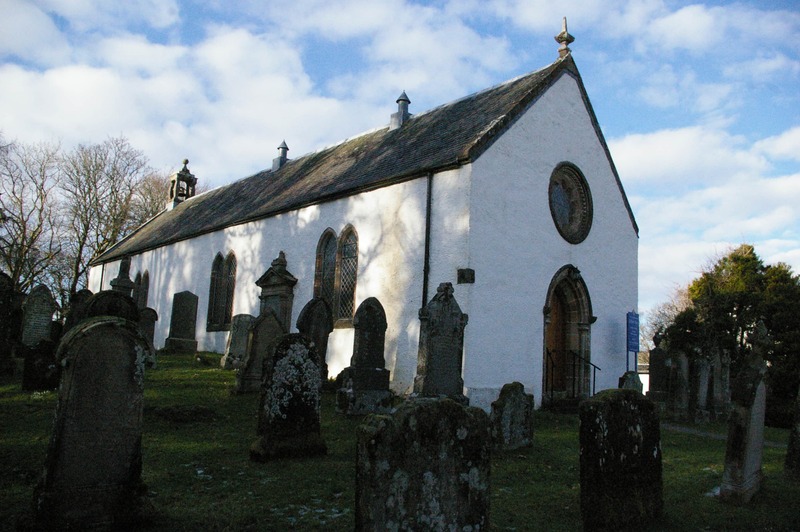 By the same charter they also granted to Paisley ‘the chapel of Kilmor’ with its pennyland (that is Kilmory, ‘St Mary’s chapel’, 6 ½ miles across Loch Fyne, just outside Lochgilphead (where the Argyll & Bute Council offices are now). 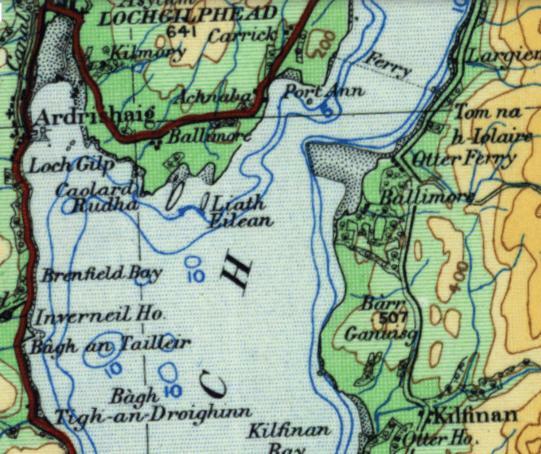 Kilfinan (in south-east) and Kilmory (in north-west) on OS quarter inch map 1920s (image courtesy of the National Library of Scotland). The Lamont or Laumannus who made this grant can be presumed to be of the family of the Lamonts who held lordship in Cowal for for centuries, but whose power was diminished first by encroachment from Stewarts in the south and later by Campbell expansion from the north. In the seventeenth century the Lamont family – under Sir Coll Lamont – constructed an aisle alongside the church, in whose vault members of that family were buried. There is now a fine collection of medieval carvings in the vault, some of which may date to as early as the ninth century. The presence of these earlier stones clearly points to an origin for this church centuries earlier than the present buildings indicate, and much earlier than the thirteenth century when Kilfinan first appears in the written record. At the time of writing (summer 2015) there are plans afoot to conserve these stones, and to mount them in a specially designed lapidarium on the site, so that visitors can enjoy them more easily, and so that these fine carvings do not deteriorate. For further information about this church, see the congregation’s own website. The church is in the heart of the village of Kilfinan, in the far west of Cowal. You can drive or cycle on the roads. It is also a pleasant walk from Portavadie. To see a good OS map of Kilfinan and area, including roads, click on ‘View Larger Map’ below.